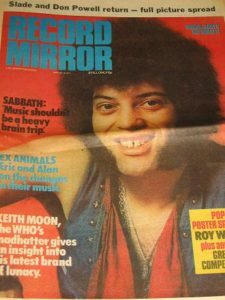 1973 turned out to be huge year for Mungo Jerry with a return to the charts in a big way with the rocking Alright Alright Alright peaking at number 3 in the UK singles chart. 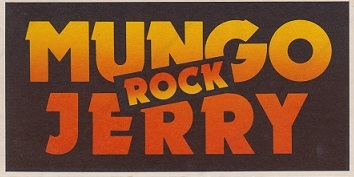 Bass player John Godfrey left the band and Mungo Jerry had a whole new line-up. 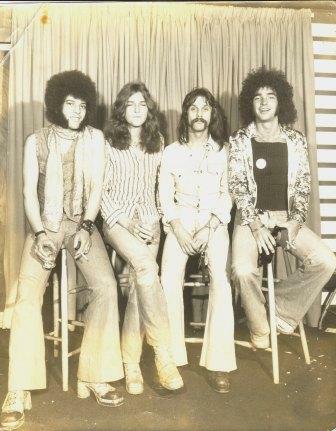 Bass player John Godfrey, who sadly passed away in 2014, decided to leave Mungo Jerry to be replaced by Bob Daisley. 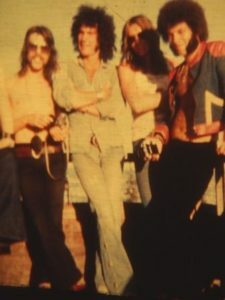 John played bass on several of Mungo Jerry’s biggest hits – Baby Jump, Lady Rose and You Don’t Have To Be In The Army To Fight In The War. 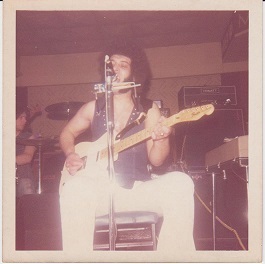 He also played on the albums – Electronically Tested, You Don’t Have To Be In The Army and Boot Power. 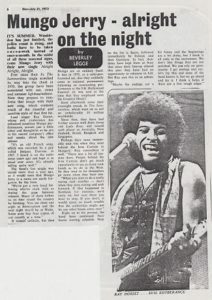 Ray Dorset on John Godfrey… “John provided some great bass lines on many classic Mungo recordings, such as Baby Jump and Lady Rose to name but two. 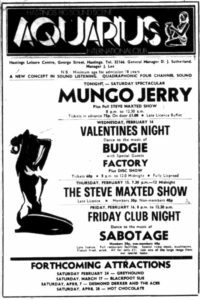 Mungo Jerry, Senate Club, 1973. 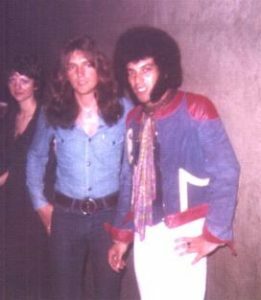 Bob Daisley & Ray Dorset – Leeds, 1973. HARLOW : 14th July, 1973. 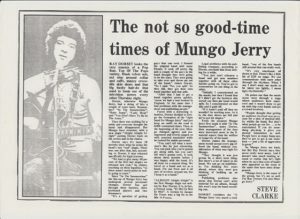 I went to see Mungo Jerry at Harlow Town Park with certain reservations as to their musical ability and entertainment value. 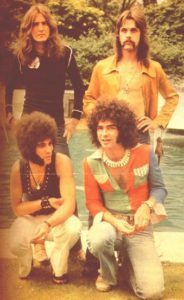 But let’s give Mungo their due, they are a very professional Top Twenty pop group and Ray Dorset has really got together a fine band. OK, so the band might lack it a little when it comes to musical inventiveness and originality, but they come up with some great tunes and play some tasty rock and roll. 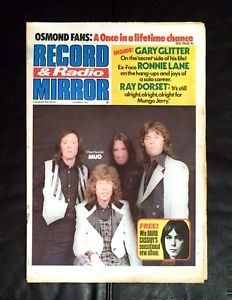 Although Mungo sound more like a rock band these days, they haven’t forgotten their old fans and played all their old favourites but with new freshness. Dorset is still the star and played the part magnificently all night. 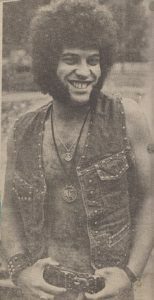 His throaty vocals and guitar playing were better than ever as he led the band into such numbers as Open Up one of the band’s many hits of the past. 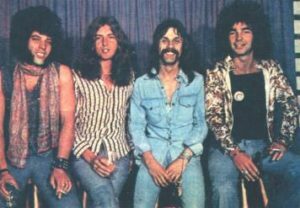 They also did great versions of their new single, Alright Alright Alright and In The Summertime which had nearly all the audience dancing or banging cans in time with the music, and my favourite number of the set, Lady Rose. Ray did something that many of our great heavy rock bands can’t. He had boppers, rockers, freaks, Mums and Dads all digging the act. 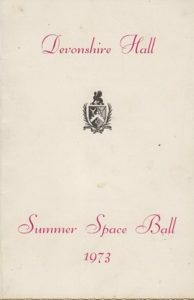 A great evening, free, in the park – in the summertime. 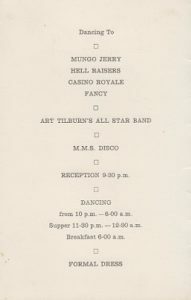 CITY HALL, CORK : 28th July, 1973. 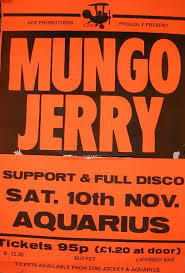 It was one of those curious quirks of fate that Mungo Jerry, with a single high in the chart, should be playing in the sweaty environs of a Saturday night dance in the Carlton Ballroom in Kilkenny in Southern Ireland instead of some more prestigious engagement nearer home. Their tour in Ireland has been a 20 night trek that has taken them North and South of the border. It was set up about three months ago so local promoter, Arthur Walters, certainly struck lucky when Alright Alright Alright became a best seller. 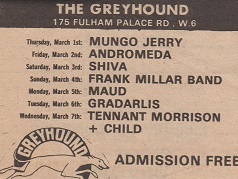 The Kilkenny date was the group’s seventeenth of the tour so it was not surprising that they sounded at times tired and that their music had ragged edges more often than not. 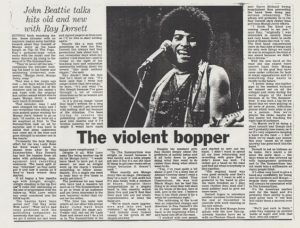 The band builds itself on a basis of raw rock and roll with Ray Dorset’s raucous, yelling vocals providing the focal point, backed up by his own competent guitar, plus organ, bass and drums. 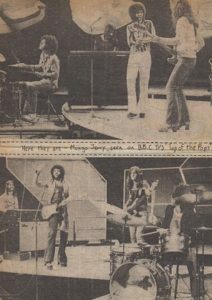 There are the obligatory performances of hits in their programme – In The Summertime, Lady Rose and Alright Alright Alright – mixed with standard rock material and Ray Dorset’s own compositions such as Mighty Man, one of his jug band style songs and Hit Me, an extended excursion using riffs from the guitar and organ. There are no musical surprises from the group. Dorset works at getting the audience involved and much of what comes from the band seems to depend on what they get from way of reaction from the audience. The Kilkenny crowd responded quite well although the wait prior to the to the group’s appearance seemed to have caused a little disappointment and discomfort in the tightly packed dance hall. 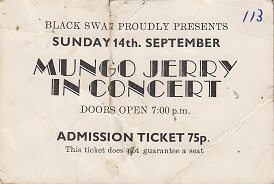 This probably wasn’t one of Mungo Jerry’s better performances understandably so because of all of the travelling they had done prior to this particular date. 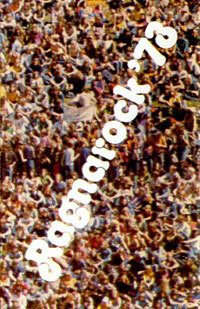 In fact they completed what is believed to be the longest tour by any British group to visit Ireland”. Tony Wilson – Music Press, 1973. 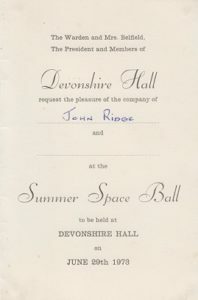 “We were made very welcome wherever we went and found the Irish people to be very hospitable. 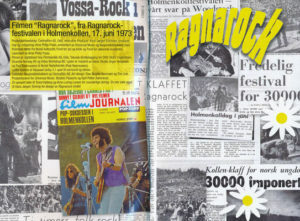 “In particular, the shows that we did in the North were perhaps a little bit more wild than usual, because of the trouble there they have been deprived of a lot of live bands. Most groups seem to be afraid to play there. “It was simple, during the sound check on a scaffold stage, I went to get off stage and someone had put a swivel chair there to step down on, and yes, stupid me, stepped down, swivelled and broke my ankle in the fall. “I remember a doctor coming forward and driving me down to the local hospital. They strapped it up and I returned to play the gig. Nothing to do with booze or drugs – just a fall. 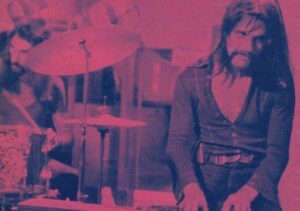 “I recall being in bloody agony and having to play the bass drum with my left foot, lucky I had been used to playing a double bass drum kit in Chicken Shack. 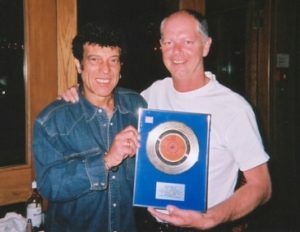 Ray Dorset presenting Paul Hancox with a silver disc for Alright Alright Alright - in 2000! “Maybe the endings are a bit funny and the beginnings shaky, but I think it all adds to the excitement. “We don’t like things that are too polished. We just rely on spontaneity. I get on stage and say; let’s try this and none of the band knows it but we go ahead and try it.